Business owners are not required to register trade names with the U.S. government, but registration offers several benefits. Registering your trade name prohibits other businesses from using the same trade name, and also provides a public record that you own the trademark to your trade name. This record can act as a deterrent to trademark infringement. Trade names are registered through the U.S. Patent and Trademark Office. Before registering your trade name, you must make sure that no one else has registered this name. Run a trademark search through the USPTO's Trademark Electronic Search Service. Select the "basic word mark search" option to search for names of other businesses. If you discover that another business is using the name you wish to use, change your business's name or consult a trademark attorney. A trademark attorney can help you make appropriate changes to your name or, if your business opened before the other business, may still be able to obtain a trademark for your business. You must attach an image of your trade name to your trademark application. This can be a computer graphic or a photo. The USPTO gives trademark seekers the option to create "stylized images" which might include a logo or unique font associated with the name. You can also simply submit a "standard" mark, which contains only words, letters or numbers. Complete the trademark application on the USPTO's web page. You must completely fill in all information about your item. You may register trademarks in all of the categories in which you intend to use the item. For example, if you are going to use your trademark on T-shirts, register it in that category. Attach a description of the products and services provided by your business to the application. 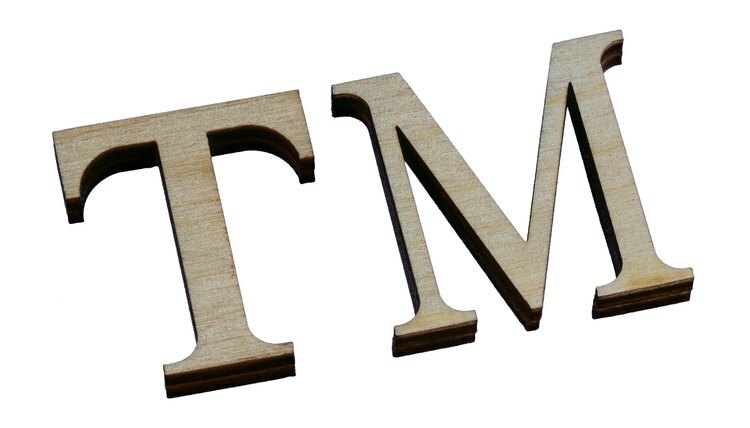 You can use a TM symbol next to your trade name immediately, but must wait until your trademark application is accepted to use the R in a circle. The USPTO will notify you when your application has been accepted and will send you a certificate. If your application is declined, the USPTO will send information about why. You may want to hire a trademark attorney to help you appeal the denial or complete a new application. Do I Have to Use LLC in the Business Name? The limited liability company, or LLC, is a creature of state law. As such, it is subject to the laws of the states in which it is organized and registered. All states have some requirements for the name of an LLC and generally have searchable online databases that allow you to determine whether your name has already been registered. Trademarks and service marks serve essentially the same purpose, but there are slight differences in how they're applied and communicated to your market. Both are administered by the United States Patent and Trademark Office. This agency processes registrations for trademarks as well as service marks. Registration isn't mandatory, but it provides additional legal protection in certain situations. Obtaining a trademark for a unique phrase that you intend to use to market the goods or services you sell in a business requires you to follow all U.S. Patent and Trademark Office application procedures. However, before you even apply for your trademark, you should be aware that the phrase cannot consist of words that other businesses commonly use.